As both a highly readable tutorial and a definitive reference for over a million Mathematica users worldwide, this book covers every aspect of Mathematica. 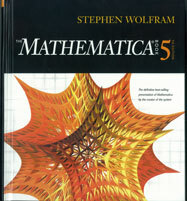 It is an essential resource for all users of Mathematica from beginners to experts. This expanded fifth edition presents Mathematica Version 5 for the first time and is important for anyone interested in the progress of advanced computing.